Feelings of anxiety vary, as does the cause. They can be triggered by short-term situations such as an important meeting, a doctor’s appointment, or an upcoming trip. They can also long-term and triggered by stress, unhappiness with a part of your life, or a fear of change. Feelings can range from feeling blue, loss of interest, shortness of breath, muscle tension, restless feelings, feelings of impending doom, and feelings of helplessness. Dealing with the feelings of anxiety can be scary and stressful. While professional help is important in severe cases, the use of crystals can be very beneficial in dealing with feelings of anxiety. Turquoise is a blending of the cold winter blue ray of Trust with the approaching warm green ray of Growth. It is the color of the earth as the new growth and life emerges at the first hints of spring. Use a turquoise-colored crystal to help overcome anxiety. Turquoise is a fresh color, a welcome color, and a color that moves us to serenity. The turquoise colored crystals help you relax, rewind, and build tolerance. 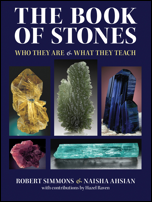 When you seek to re-establish your equilibrium and get your emotions under control, use a turquoise colored crystal. In lighter shades, turquoise energy is transformed to the power of inner harmony and peace through spiritual realization. In darker, richer tones, turquoise brings us a ray of considerable power. It is the color of flexibility. We suggest using turquoise colored crystals such as Chrysocolla which is a powerful dispeller of negative energy. It can help push the negative feels of anxiety away and calm the spirit. We also recommend Larimar which provides you inner harmony and peace, similar to Turquoise which is the most efficient healer in all aspects. Amazonite can also help you balance and rejuivante your heart and throat chakras. Any of the crystals listed here can assist you with your anxiety and feeling more calm and peace within your life. Turquoise is a most efficient healer, providing solace for the spirit and well-being for the body. It benefits the overall mood and emotion by balancing and inducing a sense of serenity and peace. Holding or wearing Turquoise helps restore depleted vitality and lifts sagging spirits. Chrysocolla is a strong dispeller of negative energy that brings a calming energy primarily to the heart. A stone of feminine power used for creativity, dispelling anger, and easing fear. 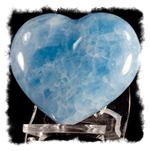 Larimar has the energy to amplify and focus the Universal Life Force to provide you the power of inner harmony and peace through spiritual realization. To know one's place in the world of man and nature, use your Larimar to find the right balance. This stone can also be used to connect your physical being to your spiritual one when you seek balance and tranquility in your life. Amazonite soothes the chakras and aligns the physical body to the etheric. It is particularly rejuvenating to the Heart and Throat Chakras, enhancing loving communication on all levels. It balances one's masculine/feminine energies as well as many aspects of the personality. Judy Hall also recommends Blue Calcite for lifting anxieties or the calming effects of Apophyllite that releases suppressed emotions and overcomes anxiety, worries and fear. Blue Calcite is primarily a stone used by women as a balancing and meditation stone for re-centering after excessive exposure to powerful Yang environments. If you need to restore yourself, meditation with calcite is highly recommended. Restoring balance is critical to your wellbeing. Judy Hall also notes the calming effects of Apophyllite which releases suppressed emotions and helps overcomes anxiety, worries, and fear. Melody says that the energy of combining Azurite and Malachite allows one to reach inner depths without fear. It produces a flow of actions and willingness toward flexibility. Azurite-Malachite's combination of energies is highly conducive to meditation by allowing one to go deep within the self, without fear, in order to be sustained, absolved, and reborn into the light, completely aware of the genesis at all times. Naisha Ahsian tells us that Petalite is soothing and healing for the emotional body. It brings a frequency in calm self-acceptance and self-love. Petalite is a stone of peace and a stone of joy. It is a stone of relaxation and one for quieting the mind in turmoil. It is a very powerful stone for meditation in which the effect is inner peace. Feelings of anxiety, whether short term or long term can be very debilitating. Please seek professional care for serious issues. Use turquoise crystals for helping cope with feelings of anxiety and restoring your inner peace and serenity. 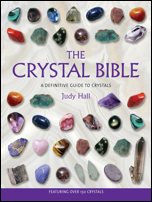 Or, perhaps try the crystals other writers have found effective to bring a calm tranquility back into your life such as Judy Hall's Blue Calcite or Apophyllite, Melody's combination of Azurite and Malachite, or Naisha's Petalite.